REPORT FROM THE U.S. – U.S. hotel construction spending has been on a tear lately. Baker said architecture firms are also beginning to slowly build up their project backlog levels, a sign that more work is coming in. The AIA’s Architecture Billings Index for September registered a 54.3. Any score higher than 50 indicates billings growth. “Design activity is clearly pointing to an uptick in construction activity,” Baker said. Bill Wilhelm, executive VP at R.D. Olson Construction, said he is seeing more interest in ground-up development. There were a total of 2,767 projects comprising 333,775 rooms in the in construction, final planning or planning stages as of September, according to data from STR, parent company of Hotel News Now. The number of projects scheduled to open in 2014 is expected to increase to 877 hotels and 98,651 rooms, up from 188 projects totaling 19,586 rooms during 2013. R.D. 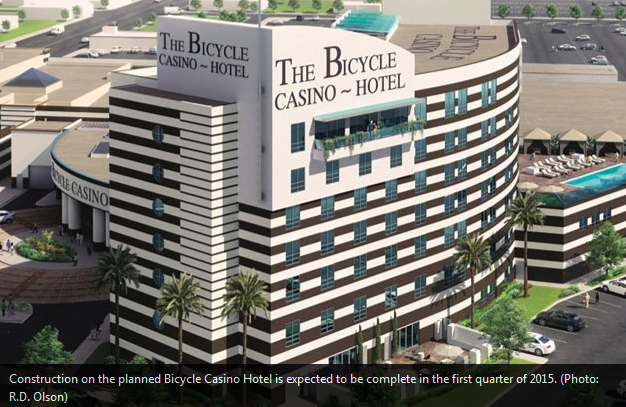 Olson is commencing construction on the $45-million, 100-room Bicycle Casino Hotel in Bell Gardens, California. Construction on the nearly 118,000-square-foot hotel is expected to be completed during the first quarter of 2015. Marty Collins, president and CEO of real estate investment and development company Gatehouse Capital Corporation, said he has noted a pickup in the amount of the sector’s activity. Much of the hotel construction focus has shifted to select-service hotels, which is what largely comprises Gatehouse’s pipeline, Collins said. The company is looking at markets including Houston, Dallas and Fort Worth, Texas. “Clearly, you’ve seen supply increasing. The difference today is there is a little bit more of an urban focus,” he said. Samuel E. Cicero, Jr., president of Cicero’s Development Corporation, said his construction company hasn’t worked on any new builds—yet. “We have been asked to look” at some projects, he said. Experts said during the Reed Construction webinar that lenders are loosening the reins on their underwriting standards relating to construction financing but not doing so in large swaths. According to the “Federal Reserve Board senior loan officer opinion survey in July,” 76% of respondents said their credit standards were unchanged, with 18% saying standards had eased and the remaining 6% reporting tighter standards. By comparison, 50% of respondents reported stronger demands for loans; 42% said they were seeing the same level of loan demand; and 8% said there was weaker demand. Renovation financing is a little easier to come by than new construction, which is proving to be more dicey, Cicero said. Most of the debt that is available comes by way of regional banks, Collins said. Increasing performance within the sector is helping to smooth some of the fears lenders might have when approached about a potential project, sources said. Regardless, “terms are challenging,” Wilhelm said of the debt developers are able to find. While there are some new builds going up, a lot of the activity today is related to renovation projects, sources said. Owners are still trying to get caught up on their property improvement plans, which is driving a lot of the action. Much of the work is focused on infrastructure improvements, Cicero said, including heating, ventilation and air conditioning; lighting systems; power; and mechanicals. Wilhelm said guest-facing areas are also seeing work, such as lobbies, restaurants and meeting rooms, for instance. As for costs, Wilhelm and Cicero said they have seen slight increases in raw material prices, but nothing dramatic. Cicero said the increases amount to about the cost of inflation—2% to 3% cost increases a year. “Nothing that’s too far out of line,” Cicero said. Looking ahead, Wilhelm said he expects the recent spate of hotel construction spending activity to continue, especially as the overall industry recovers. “We see a good environment for the next three years,” he said.